Aplia Econ Blog: News for Economics Students: Paper or Plastic? Recently several California towns and counties introduced new rules concerning single-use grocery bags in an attempt to reduce the harmful effects of paper and plastic refuse on the environment. Plastic bags are banned completely while stores are required to charge 10 cents for each recyclable paper bag the customer wants to use. Proponents of the new policy argue it will reduce harm to marine life, damage to utility systems, reduce litter and waste, and conserve natural resources. The opponents, however, maintain that single-use bags are not only convenient for shoppers but actually serve multiple purposes after the initial usage, ranging from waste basket and cat litter containers liners to bike seat covers. The opponents also argue that the ban on plastic bags will boost consumption of a variety of plastic products to substitute for plastic grocery bags, which is not only costlier at the individual level but also might inflict more harm on the environment. The research on both sides of the argument is still inconclusive and lacks hard evidence. However, economic theory might yield some insights and help us see the much needed middle ground. What we know with certainty is that at the individual level, people benefit from using single-use grocery bags. We also know that prior to the ordinance’s passage, the bags were given indiscriminately and for free. But the bags are also arguably bad for the environment and require recycling, and thus are costly to society. In economic terms, this means the bags create a negative externality – a cost that is not born by the consumers who enjoy the benefits of this product, but by society at large. This cost likely exceeds the benefit from using them. 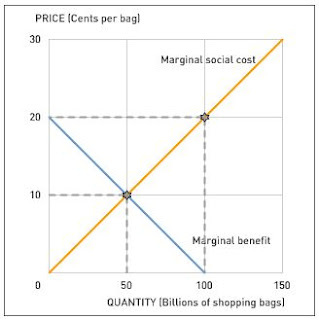 The graph shows marginal social cost of and demand (or marginal private benefit) for single-use bags in the economy. Suppose that the quantity demanded is 100 billion shopping bags every year when they are given away for free (i.e. when price equals zero). According to some research, this might not be far from the truth for the United States. Suppose that at this quantity, the marginal social cost is 20c per bag, which exceeds the marginal benefit and is therefore not optimal. The law of demand dictates that charging for the bags will reduce consumption. Suppose that a fee of 10c per bag reduces consumption to 50 billion bags, equating the social costs and private benefits of single-use bags. The 10c fee per paper bag is nothing but a Pigovian tax (named after the English economist Arthur Pigou) as it counteracts the negative externality. If the amount of the tax is set equal to the cost brought about by the negative externality, it will produce an efficient outcome: Only those who value the convenience of having grocery bags ready at the checkout enough to pay for the harm the bags cause will purchase them. So where does the 10c fee come from? And why ban plastic bags completely instead of charging a fee for them as well? For one thing, the negative externality created by a paper bag is relatively easy to calculate. Since paper decomposes quickly without producing lasting damage to the environment, its harm equals the cost of recycling. So, there is a good reason to believe that the 10c tax is efficient enough. Unfortunately, plastic is another matter. The negative externality from plastic bags exceeds the cost of recycling as it also includes the damage to the environment done by discarded plastic bags, which is difficult to estimate accurately. In the absence of reliable cost information, it is hard to calculate an optimal Pigovian tax. Therefore, it seems reasonable to ban free plastic at the stores and let the market decide the price for substitute products. 1. Are single-use grocery bags normal goods? 2. What if the actual negative externality from a paper bag is less than 10c? 3. Could the single-use bags ordinance affect retail grocery sales?